Pat’s love of stage began in the 4th grade, when cast as a sorcerer she had to recite: “When king is queen, and queen is king, When backward forward prince is seen, When all shall be as I have spoken, Then shall the wicked spell be broken.” Thus the spell of a fourth grade acting career was broken, freeing Pat to get a life which is now under the spell of whimsical improvising with Women Of Whimsy. 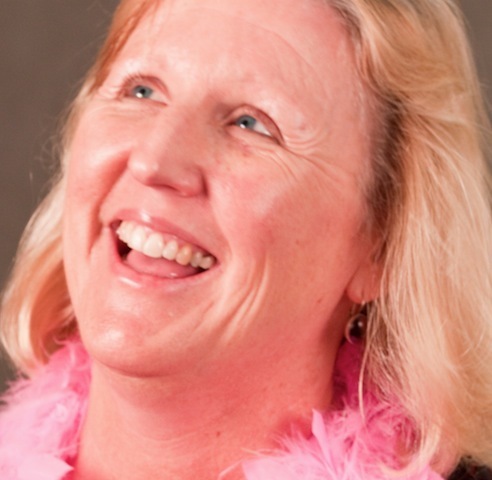 When not spellbound by improv, Pat serves as the Director Of Educational Services at Community Hospital Of Monterey Peninsula (CHOMP) and volunteers at Pacific Grove’s library and museum. Pat is also spellbound by the spectacular, natural beauty of the Monterey Peninsula. She surrenders to this spell by romping in the hills of Carmel Valley, and frolicking in the waves at Asilomar. However due to metaphysical limitations, romping and frolicking occur on separate occasions.